Atharva-veda means `the Veda of the Atharvan` or `the Knowledge of Magic Formulas`. 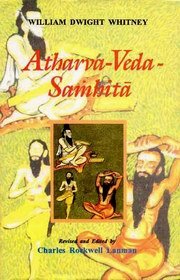 The great importance of the Atharva-veda Samhita lies in the fact that it is an invaluable source of knowledge of popular belief as yet uninfluenced by ancient Indian priestly religion, of the faith in numberless spirits, imps, ghosts, and demons of every kind, and of the witchcraft, so eminently important to ethnology and for the history of religion. This work includes in the first place, critical notes upon the text, giving the various readings of the manuscripts; second, the readings of Paippalada of Kashmere version, furnished by the late Professor Roth; furhter, notice of the corresponding passages in all the other Vedic texts, with report of the various readings; the data of the Hindu scholiast respecting authorship, divinity, and metre of each verse; also references to the anciallary literature, especially to the well-edited Kausika and Vaitana Sutras, with account of the ritualistic use therein made of the hymns or parts of hymns, so far as this appears to cast any light upon their meaning; also, extracts from the printed commentaryp and finally, a simple literal translation with introduction and indices. William Dwight Whtney (1827-1894) studied Sanskrit for three years in Germany, and gained wide reputation for his scholarship in this field. At Yale University, he became professor of Sanskrit in 1854, adding comparative philology in 1869. He became secretary to the American Oriental Society in 1857 and its president in 1884. He was editor-in-chief of the first edition of the respected Century Dictionary, published in 1889.